Yields 11 or more dependso onot the sizes. Take the flour in a mixing bowl, add sooji, ghee, salt to it and rub them with your hands to get them well combined. You will get a crumbly mix. Now add the warm milk, sprinkle water (if needed) and mix to get a smooth dough. I added about 1/2 tsp of water. Keep the dough covered with wet cloth for about 20-30 minutes. Meanwhile we will start with the filling. Heat a pan, add the khoya and saute in low- medium flame until it turns slightly golden brown. By now the oils in them will start to ooze out. Turn off the flame keep it aside and let them cool down to room temperature. .
Peel the skin of almonds and pistachio by soaking them in hot water for 5 minutes, and then slice them finely. Dry roast the freshly grated coconut in low-medium flame for a few minutes until it is slightly dry. Now to the cooled khoya, add the roasted coconut, sliced and chopped nuts (preserve some for garnishing), raisins, sugar, cardamom powder and mix thoroughly. Filling is now ready. Prepare a flour paste by mixing flour and water thoroughly. Now we will come back to the dough. Again knead the dough to make it soft. Divide it into small equal sized balls and roll each of them into thin discs. Now place a spoon full of prepared filling at the center of the disc and apply the flour paste to the sides of the disc. Fold to form a semi circle. With the help of your fingers press the sides to get the perfect packing with no gaps. 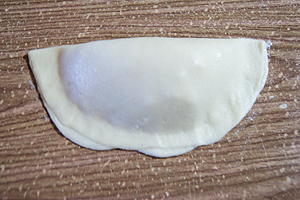 Then fold the corners of the gujiya as shown below just cut with a pizza cutter to get a perfect shape. You can also give a fork impression on the corners. Repeat the same with all the dough balls. Then heat a kadai with oil. Fry the prepared gujiyas in low-medium flame until both the sides turns golden brown by flipping them at regular intervals. Do fry them in batches to maintain the oil temperature. Drain the excess oil on a paper napkin. Now we will move on to the sugar syrup. Heat a pan with sugar, water and stir until the sugar dissolves. Add the essence, lemon extract, saffron and let it boil until one string consistency. Turn off the flame. Now add the fried gujiyas to the sugar syrup. Immerse them such that both sides are coated with syrup. Remove the gujiyas and transfer to the serving plate. Garnish with chopped nuts we had reserved. Enjoy warm or normal room temp. - To get the perfect texture, keep the dough covered with wet cloth all the way during the process. - While sauteing both khoya and coconut be careful. They will get burnt easily. So saute them in low-medium flame. Keep stiring continuously till done. - Instead of using fresh coconut and roasting them. You can even use store bought dry shredded coconut. - For the given measurement, I got extra filling in which I can prepare 5 more gujiyas. Do adjust the dough quantity accordingly. 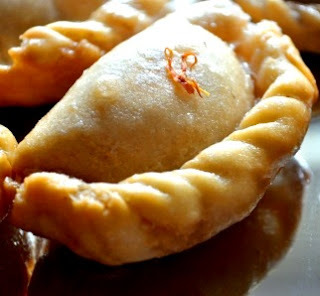 - You can also skip coating the gujiya in sugar syrup and enjoy it as it is after frying. However you may want to add extra sugar to the filling. - Adding lemon extract to sugar syrup is to stop crystallizing of sugar after cooling. You can skip, if you are going to consume immediately.